Big Agnes Soul Kitchen Camp Table. Eliminate the messy disaster that is eating your dinner in a camp chair with a plate in your lap or trying to prep food on a log, rock, or tailgate full of dirt. The Soul Kitchen Camp Table provides a sturdy, spacious platform for all things food, kitchen, and eating related. Set down your drink on this hardtop surface instead of uneven ground where it will inevitably spill. 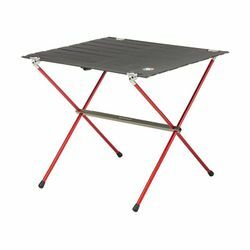 This super-easy-to-set-up table holds up to 90 pounds and has ample room for that kitchen sink you brought. Length x Width: 27.5 x 24"